If you thought Alaska was pretty warm and dry this winter, you were right. In fact, it could come close to setting a record. The latest figures released by the National Oceanic and Atmospheric Administration’s National Centers for Environmental Information show it may be the second warmest winter since they started keeping Alaska temperature records 90 years ago. For the Alaska Peninsula, Kodiak Island and the north Gulf Coast, the winter of 2015-16 was the absolute warmest. 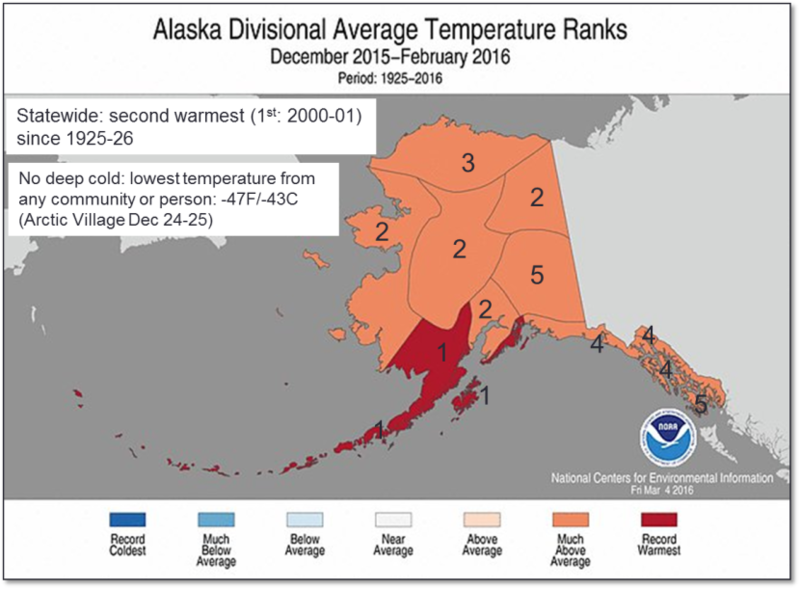 For other areas from Northwest Alaska down to the Southeast Panhandle, it was within the top five warmest winters. Rick Thoman, a climatologist with the National Weather Service in Fairbanks, points to the lowest statewide winter temperature as an example of how unusual and how persistent the warmth has been in Alaska. The lowest recorded temperature this winter in the state was minus 43 degrees Fahrenheit. That was in Arctic Village around Christmas. Thoman said for the entire state, winter temperatures were significantly above normal for 61 days out of the winter’s 91 days. Statistically speaking, that’s twice as many as you’d expect. Since the 1970s, Thoman said Arctic winter temperatures have been increasing about 1.4 degrees Celsius a decade. It was also a fairly dry December through January throughout much of the Interior and the northern part of the state. Exceptions included Southcentral, the Gulf of Alaska coast and northern Southeast which were all slightly wetter than normal. Thoman said the seasonal maximum sea ice extent in the Bering Sea is shaping up to be the lowest since 1979. 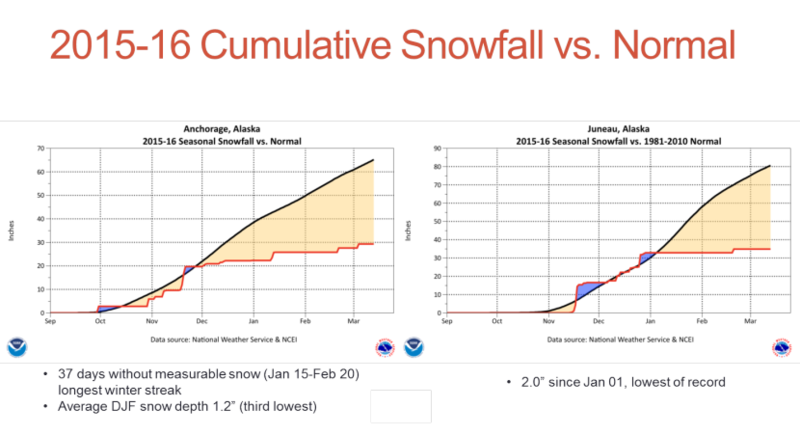 The overall Alaska snowpack is better than last year, but winter snowfall in areas like Anchorage was still below normal. 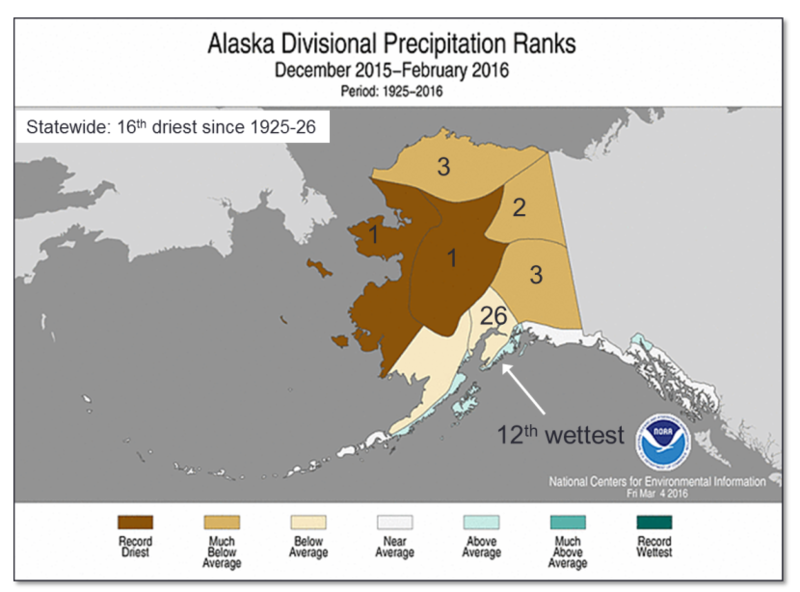 So, what’s the cause of the warmer winter temperatures and less precipitation in many Alaska regions this winter? Thoman said it’s a combination of the warm water sea surface temperature anomaly in thenortheast Pacific Ocean known as The Blob and one of the strongest instances of El Niño, or equatorial ocean warming. Both events can affect the southern or eastern portion of the state. Low ice coverage in the Bering Sea can also affect the western Alaska climate. “At this point, the Arctic is clearly leading the rest of world in overall climate change. The overall warming is greater,” said John Walsh, chief scientist at the International Arctic Research Center located at the University of Alaska Fairbanks. Walsh is co-author of an extensive report just released by the National Academy of Sciences that analyzed recent research of extreme weather events like heat waves, droughts and heavy precipitation and whether such events could be attributed to climate change. Walsh said climate change may be enhancing the variability of unusual weather events and shifting the extremes. But aside from the shift to more extreme temperatures in Alaska and the Arctic, Walsh said there’s not yet a smoking gun, nothing that stands out when linking recent events to climate change. At least, not yet. Walsh suggests that all it takes is for someone to do the research. What could all of this mean for Alaska this spring and summer? Thoman expects warmer than average temperatures across Alaska and northern Canada. “Given the state of the snowpack, which is in the Interior overall pretty near normal, at this point we would probably favor an earlier than average breakup and so a reduced, but not zero chance, of significant ice jam flooding,” Thoman said. Thoman said a low winter snowfall could add to the wildfire danger this summer, although this winter’s snowpack was still better than the previous year’s snowpack. He expects slightly above normal precipitation, which may be good as long as it doesn’t come with thunderstorms that ignite wildfires. Next article$50K for a pot permit. If you’re lucky.